Review posted November 26, 2018. 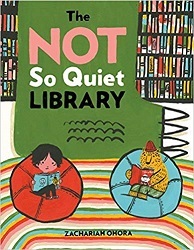 This book definitely leans toward the silly side, but it features a library, so what’s not to like? Every Saturday, Oskar and Theodore got up bright and early. Not to watch cartoons, or play outside with their friends. It was the day they went . . .
. . . to the library with Dad! In the children’s department, a five-headed monster attacks! When it finds out that books aren’t for eating, it decides it will eat Oskar and Theodore. There are lots of delightful details in this book. My favorite is the picture of Dad tying a pile of books to the top of their car to go to the library. The inside of the car is full of books, too. They leave the library the same way. It’s all just so silly – but such a nice celebration of libraries.